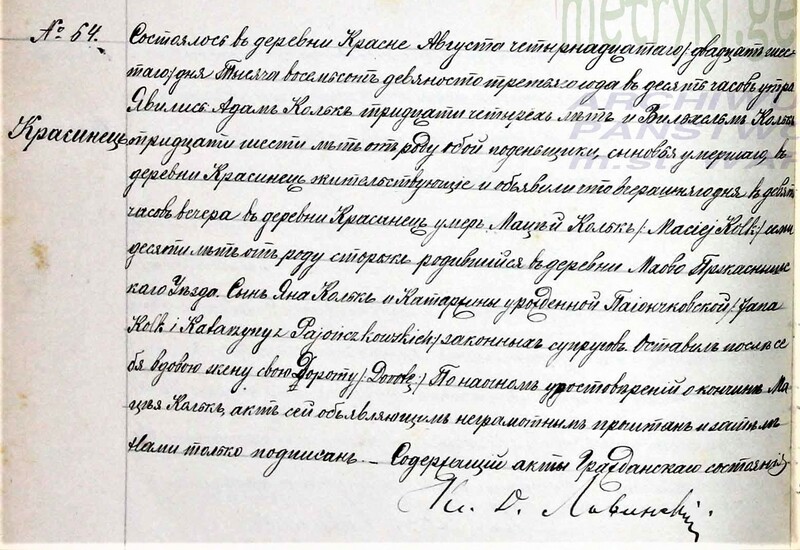 I am looking for the translation of my great-grandparents marriage document from Russian to English, please. Their names are Szczepan Brzeczkowski and Stanislawa Pierzgalska. All information is welcomed as I would like to know if the names of their parents and birth places are included. Thanking you, in advance, for all your time and assistance. Częstochowa, St. Barbara's parish, 5pm (13) 25 July 1894. Witnesses: Ignacy Sosiński, blacksmith, aged 42 & Antoni Konopka, shoemaker, aged 29. Bridegroom: Szczepan Brzeczkowski, bachelor, aged 20, born at the village and parish of Krzywosądz in the Warsaw district, son of Wojciech Brzeczkowski, gardener and Mary Chmielewska. Bride: Stanisława Piżgalska [such spelling here both in Russian and Polish], virgin, aged 19, born in Częstochowa in St. Zygmunt's parish, living now in St. Barbara's parish with her parents Jan Piżgalski and Bronisława Kulińska. This is followed by the standard info about the (three) banns, no canonical impediments, no premarital agreement, name of the vicar who signed the act himself, as all the others were illiterate, etc. 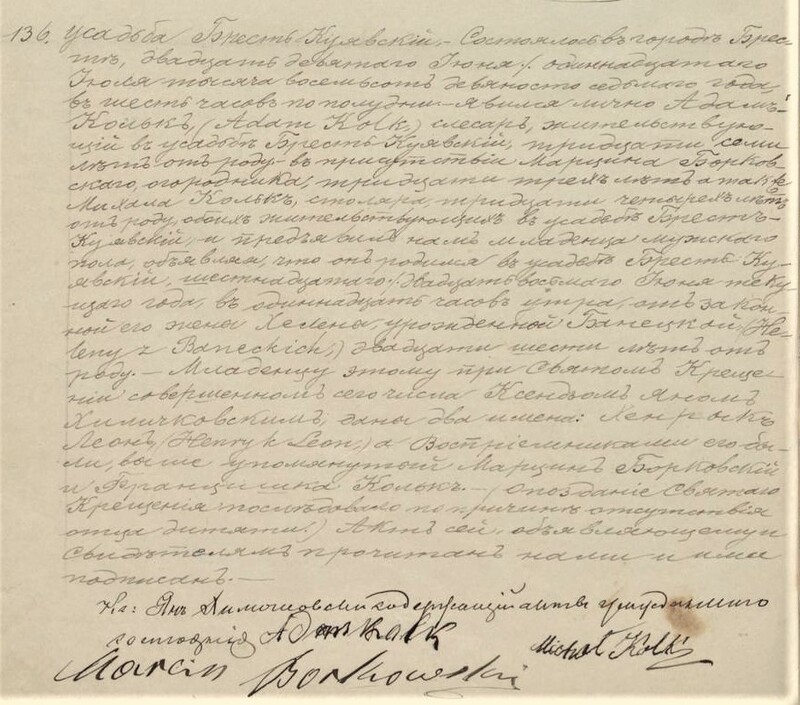 The earlier records are in Polish, so you'll be able to easily find the baptism records of Jan (c1849) and Bronisława (c1852) in the same parish and then possibly the marriages of their respective parents and so on, and so forth... Good luck! Ostatnia2 miesiąc 3 tygodni temu edycja: Molencki (Rafał Molencki) od. Rafał: I cannot thank you enough for what you have done for me and my family. My mother, Joan Brzeczkowski-Osypiewski, just turned 88 years old and this is going to a part of her birthday present! Thank you so much, again. Rafał: Nie mogę ci wystarczająco podziękować za to, co zrobiłeś dla mnie i mojej rodziny. Moja mama, Joan Brzeczkowski-Osypiewski, właśnie skończyła 88 lat i to będzie część jej urodzinowego prezentu! Jeszcze raz bardzo dziękuję. Pleased to hear I've been helpful. Regrettably, the Krzywosądz records are not available online. 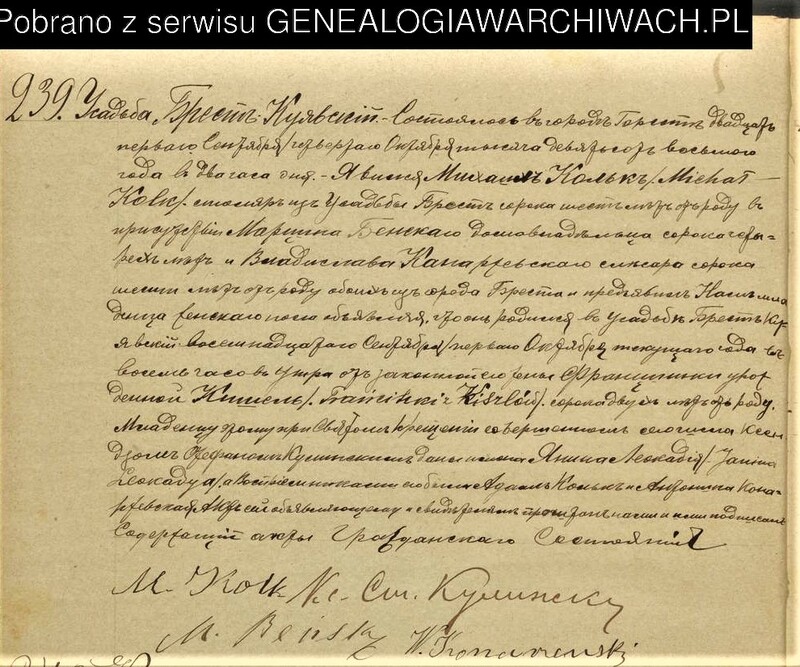 If you want to trace the Brzeczkowski history, you need to look through the parish records (including Szczepan's baptism c1874) in one of the Family History Centers: the relevant years are there! Many happy returns to your Mother! I think I may have found Szczepan's birth record. I have attached it here, if you could, please, translate once more. Please, let me tell you about how thankful and excited my mother was when I gave her the information you provided; she was like a little girl with a new doll! I don't ever recall her being so excited and deeply appreciative of what you did for us. My parents will be married 65 years this August and I would like to bring them to Poland to visit the homeland of their parents. Again, my best regards to you and thanks for all you are doing for my family. Rafale, chyba udało mi się znaleźć zapis urodzenia Szczepana. Załączam to tutaj, jeśli możesz, proszę, przetłumaczyć jeszcze raz. Pozwól, że opowiem Ci o wdzięczności i podekscytowaniu mojej matki, kiedy przekazałem jej informacje, które podałeś; była jak mała dziewczynka z nową lalką! Nigdy nie pamiętam, żeby była tak podekscytowana i głęboko wdzięczna za to, co dla nas zrobiłaś. Moi rodzice zostaną małżeństwem 65 lat w sierpniu i chciałbym zabrać ich do Polski, aby odwiedzili ojczyznę swoich rodziców. Ponownie, pozdrawiam was i dziękuję za wszystko, co robicie dla mojej rodziny. That's him, indeed! 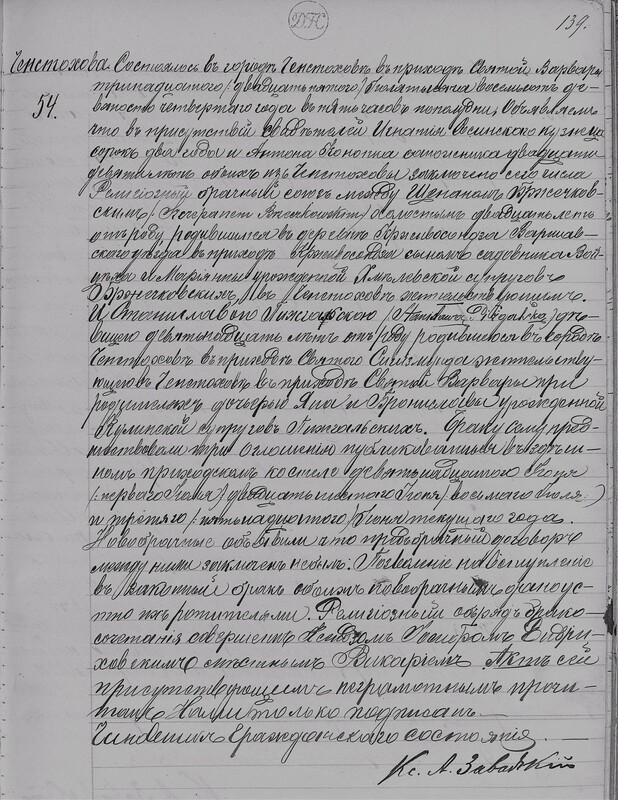 Szczepan Jan born (2pm) and baptised (7pm) in the village of Krzywosądz on 9 Dec 1873 of Wojciech Brzeczkowski, gardener, aged 56 and Marianna Chmielewska, aged 40. Godparents: Kazimierz Stramowski and Jadwiga Kołakowska. If you have access to the book of marriages, it's definitely worth checking, as I have a strong suspicion that they might be Szczepan's parents married at such relatively old age having been widowed from their earlier spouses. Wojciech's surname may have been misspelt (or misread) in either Geneteka or by the priest who wrote the record. In the wedding record there will be the info about their birthplaces and the names of their parents. I am doing very well in my research efforts and I have you to thank for getting me started on my journey. My mother is so thankful that I found you to help us. 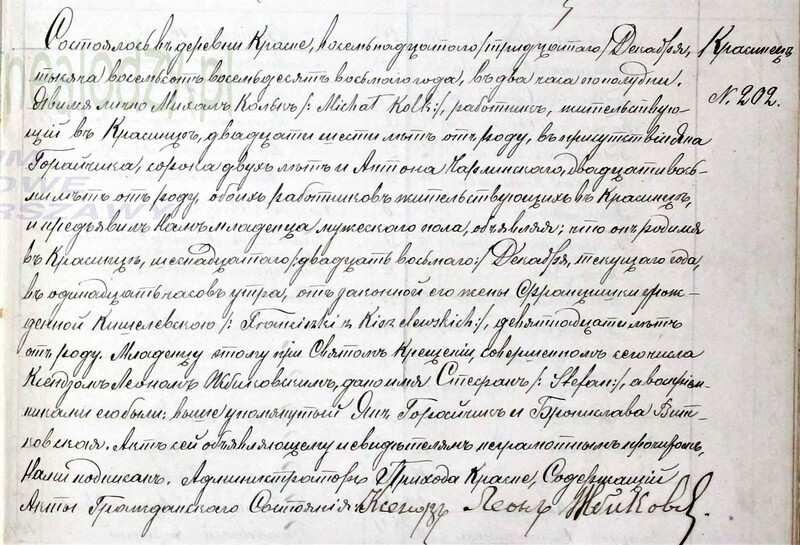 I have gone through the Polish records and now I am into the records written in Latin! Along the way, I have become quite proficient in reading Polish documents thanks to several books and the online translator. Ultimately, it is you that I owe my gratitude the most. 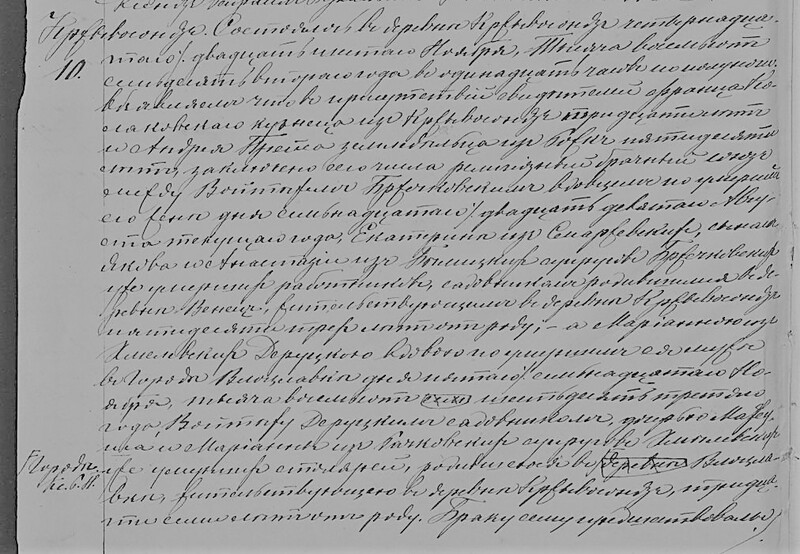 I am trying to decipher records in Russian and, please let me share my experience. My search has taken me deep into Polish history to further understand the experiences of my family. 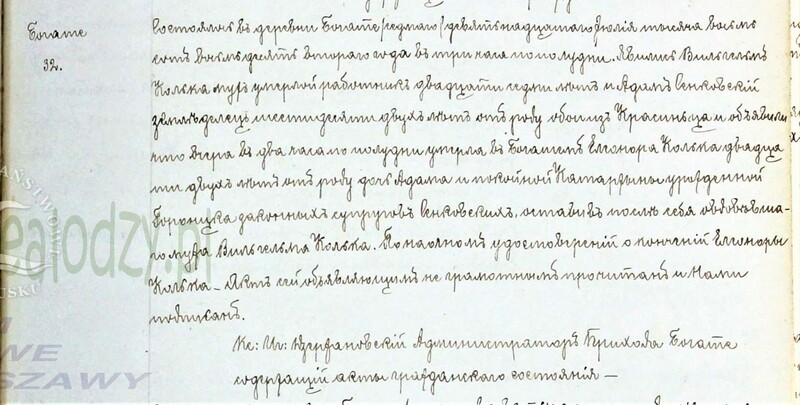 The Russian occupation of your homeland was a brutal time and terribly unjust to the Polish people. The Russian language is ugly and I struggle to understand and interpret - so unlike Polish, which is beautiful and eloquent. So, Rafal, I ask you please to translate another document. 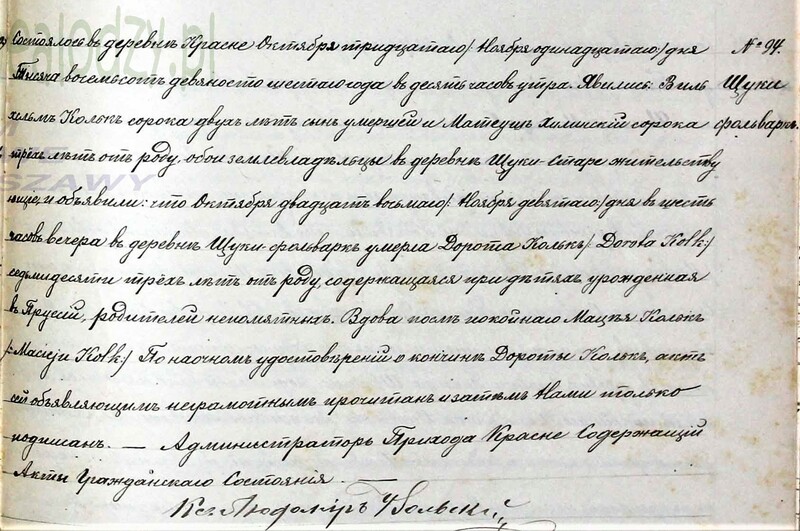 This is the marriage document of Wojciech Brzeckowski and Maryanna Chmielewska. As you pointed out before, both were older and widowed at the time of their marriage in 1872. I am unsure of Maryanna's maiden name. 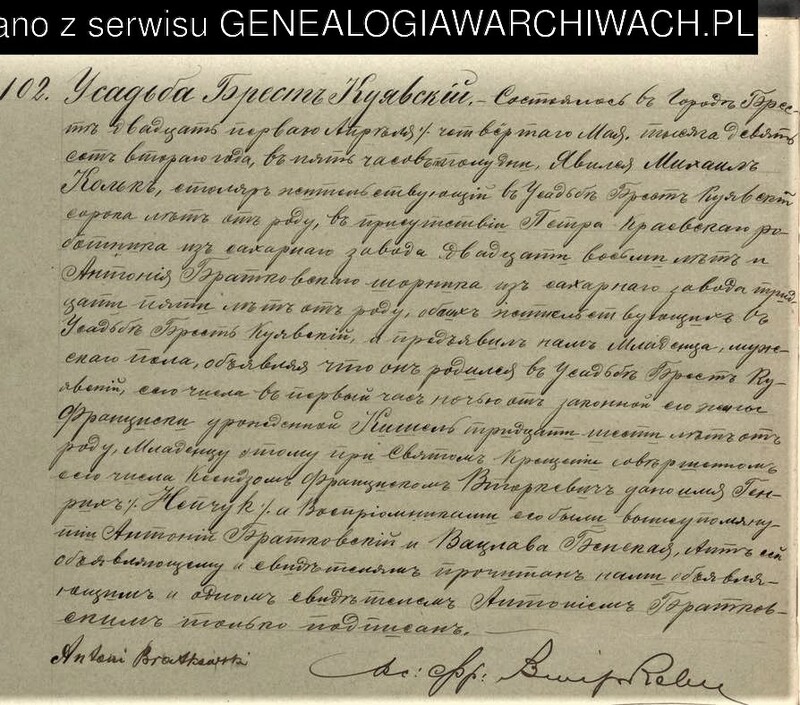 Also, I have discovered Wojciech's parents in birth documents from Wieniec. I am trying to research Maryanna's family. Could you provide as much information as possible on this document? I would like to try to learn so of the key words (although I have a book, sometimes the words are not easy to translate. Also, we so much appreciate all of your work that we would gladly make a donation to all of your efforts. I do not mean this as an insult, but as an offer of generosity and thanks. I do research for people in Poland in the USA and I am willing to help out in any way that I can. Thanking you again for all you have done. The document attached is in two parts because it was on two pages in the book. 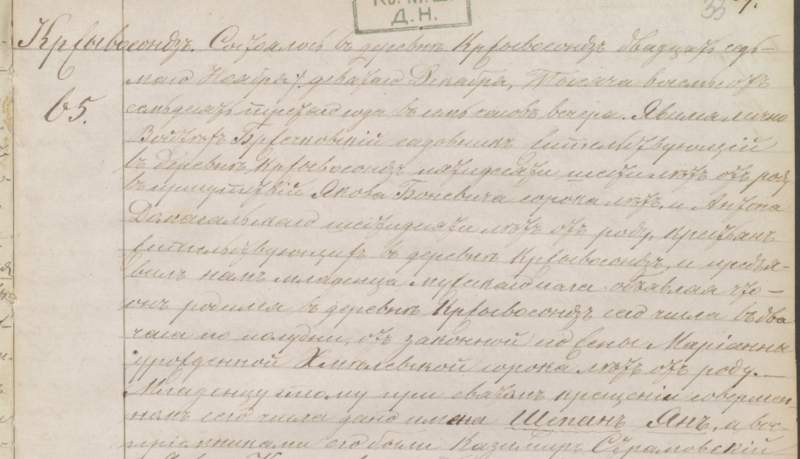 If you manage to find the relevant records from Wieniec and Włocławek, they will be in Polish, as Russian regrettably replaced Polish in public records in the early months of 1868 as one of the punishments for the January Uprising. Good luck! Ostatnia2 miesiąc 1 tydzień temu edycja: Molencki (Rafał Molencki) od. I hope that you enjoyed your holiday. Thank you for the last translation. It was very helpful. 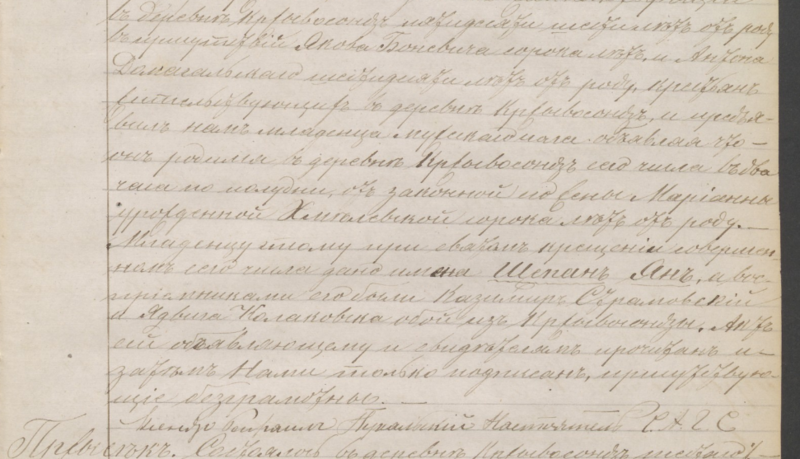 I am getting much better at reading birth records in Russian. Now, I have a some very special ones. I have finally begun to discover my mother's maternal family: Michal Kolk and Franciszka Kiszel. The first record I am attaching is my Uncle Stefan's birth record. I am looking for the names of the villages and occupations to further assist me in researching the family. I have extracted the dates already. I can't tell you how much all of this means to me. The day I found the birth record of my maternal grandmother was the best! She was very special to me. So, I will attach these documents one at a time. Thank you for all you do, Rafal. 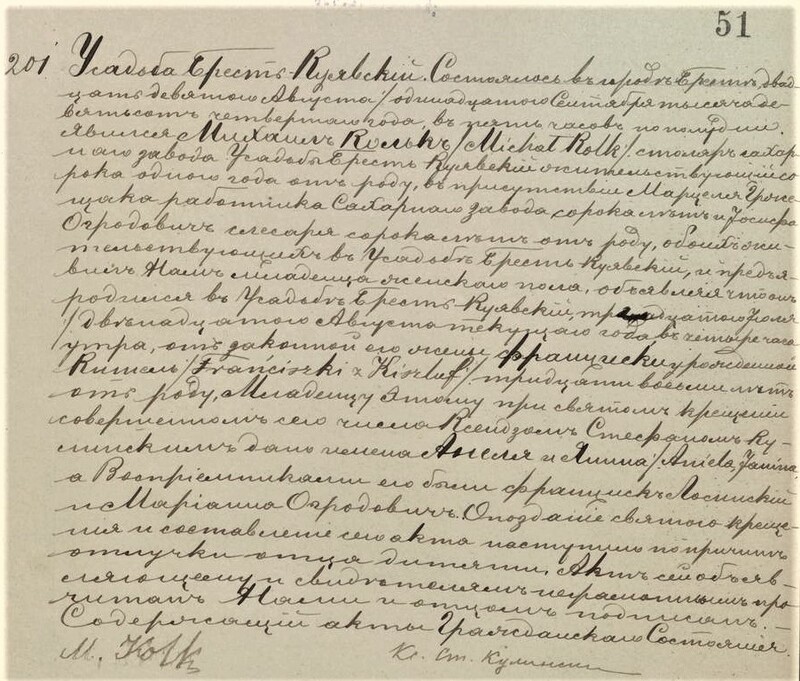 This document is the marriage record of my great-grandfather's brother, Wilhelm. Again, I am hoping to gain insight into where they lived before they came to Krasiniec. My Uncle Stefan was born there; however, 4 of the other 7 chuldren were born in Brześć Kujawski. Thank you again! These are two death records from the Kolk family. I believe one is the sister (Anna) of my great-grandfather, Michal (son of Maciej). The other appears to be the daughter of Wilhelm (Michal's brother). Now, I will begin to learn to read these other documents. But, you are the best!!! And thanks to you I AM TRYING! I have met a cousin in Czestochowa through Facebook. He is now interested in our Pierzgalski family history. I told him about your group and what you have to offer. Keep up the great work. Thank you again for all that you do for me! We have discovered a family tragedy. 18 July 1882, not only did Anna Kolk (my ancestor) die along with her sister-in-law, Eleanora (who left a 1-1/2 year old baby daughter, Wladyslaw), but Eleanora's 25 year old sister, Maryanna, died also that day at 2pm! It would be very interesting to find out what caused their deaths. All three died in Bogate, a village 2.7 km from Krasiniec (a half hour walk). The record for Maryanna was located between those of Anna and Eleanora. I checked for other casualties that day and found none. An interesting, but sad, part of our family history. Here is the birth record of my grandmother, Jadwiga Kolk. I'm interested in the name of the village (I know about Brzesc Kujawski) Is it Usadaba? I can't find it on a map. Also, the interesting part of this family is no children were born between 1890 and 1900 - and they moved from Krasiniec to Brzesc. I can only think that maybe my great-grandfather was somehow involved with the building of sugar beet manufacturing plants. Again, so many thanks to you for everything! Kathy, the Russian word is not 'usadaba', but 'usad'ba' 'усадьба' [the fifth letter is the so-called soft sign, which marks what we linguists call palatalization or softening, something that you have in Polish characters ś,ć,ń,ź] and it corresponds to Polish 'dwór' or English 'manor house, homestead'. You are right in your guess that Michał Kolk was a craftsman employed by the owner of the manor house, who probably also owned the nearby sugarplant. If so, the place is now up for sale! The record itself says that on 30 Sept 1906 Michał Kolk, a carpenter or joiner from the usad'ba, aged 43, in the presence of Adam Kaźmierski, 33, a bricklayer or mason, and Marcin Beński, 40, a householder, showed a baby girl born in the BK manor/homestead at 8pm on 16 Sept of his lawful wife Franciszka Kiszel, 39. During the baptism ceremony performed by Father Stefan Kuliński the girl was christened as Jadwiga Joanna and the godparents were Władysław ?Kołaczewski and Joanna ?Marzęcka (I'm not sure if I deciphered their surnames correctly). In the last sentence there is an explanation that the baptism was so much delayed on account of the father's absence. My mother sends so many thanks and blessings to you for everything. I called her with the latest "news" and she wanted me to send you her personal thanks for all you have done. You have made her very happy. She has begun to share many memories of her grandparents (Brzeczkowski, Pierzgalski, Kolk and Kiszel) with me. She is going to contact her younger brother (who lives in my grandparents home) to see if there are any papers there. I am attaching the birth records of my uncle Henry (Henryk), and my aunts Angeline (Aniela) and Jennie (Janina). I have the dates deciphered. I am looking for any information which may indicate where they came from and Michal's occupation. Michal was a master cabinetmaker and woodworker. He did all the crown moulding work for the mayor's mansion in Buffalo, NY. It is beautiful work and many people still admire it. He was one of the first members to join the Carpenters and Joiners Union in Buffalo and received many awards for his craftmanship. My grandfather, Henry Brzeczkowski, followed in his footsteps and was a carpenter and owned a large contracting business. I have special wood working tools that my great grandfather brought with him from Poland in 1909. Rafal, again many thanks for your hard work and the joy it is bringing to my family. I have attached a picture of my Kolk family taken in Wloclawek in 1909 before they left for America. My Uncle Stefan had already came to the USA and my Aunt Myrtle (Maryanna) was working when the picture was taken. It's nice to see all of them in the photo that you posted last night. There is no info about their parents' places of origin. In Aniela's record Michał is described as the sugarplant joiner, in the other two as the manor house joiner. Most of the godparents are sugarplant workers. I also suspect in reading the history of the Krasiniec area and knowing my family's thirst for freedom and justice, Michal may have become acquainted with some people who may have been involved with political freedom and social justice issues. My mother related that he was a volunteer fireman both in Poland and in the US. The photographer of the picture I sent to you yesterday was a noted industrialist and social activist from Wloclawek and one of the founders of the first volunteer fire brigades in that city. Additionally, my Uncle Stefan came to the US in 1906 at age 19 on a forged passport using an assumed name (I believe to escape the Russian army draft). I finally found him on the ship manifest. The path is leading me to solve many mysteries and I find that my instincts are proving to be correct (so far). This is so different from the Perzgalski family (whom, with your help) I have traced back 7 generations to 30 of 32 four times great grandparents of my great-grandmother! But, they have all lived in Częstochowa. The Brzeczkowski's have resided for 5 generations in the Wieniec-Brześć Kujawski area. I have traced all 24 of the three times great-grandparents of my great-grandfather. And, I have you to thank for getting me started on this wonderful journey! Have a wonderful day and I'm sure we will talk again soon. Kasia, I'm impressed seeing how much you've been able to find in such a short time. There will always be gaps in the trees, but there will also be new discoveries, sometimes in unexpected moments after months of stalemate. I've been in the business for less than four years and have managed to trace my and my wife's ancestries at least six or seven generations back, in some branches even ten or eleven, in four different regions of Poland and what used to be Poland, but now is West Ukraine. Vital records are the basis of course, but archives are full of all kinds of legal records (e.g. last wills, purchase contracts, lawsuits), censuses and many other documents, which can tell us a lot about our forefathers and foremothers. Good luck with your attempts and feel free to contact me any time. Ostatnia1 miesiąc 1 tydzień temu edycja: Molencki (Rafał Molencki) od. Thank you for the lead to the manor house in Brzesc! I have found several more websites showing pictures of the "Sugar Palace", the home of the directors of the Brzesc Sugar Refinery. The manor has transitioned into a recent adult care facility. 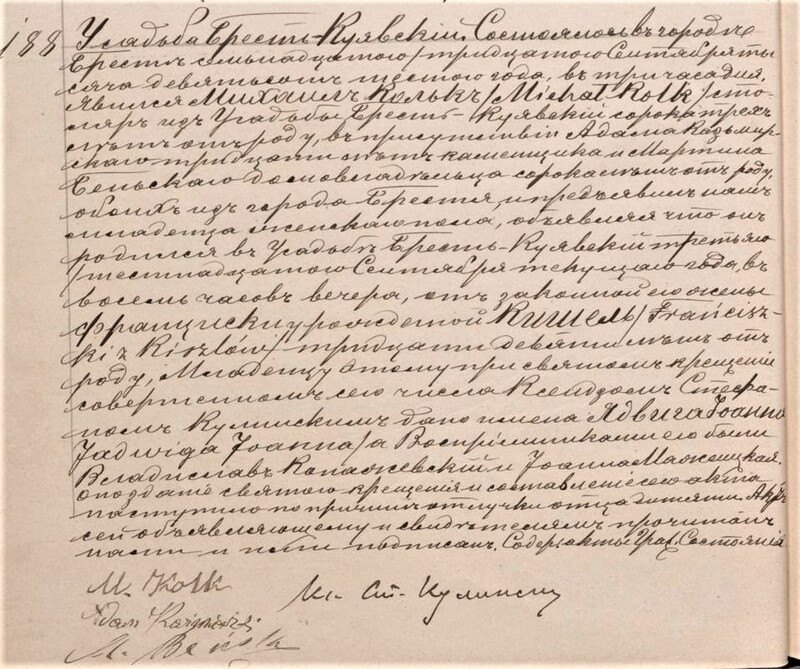 I also found documents that indicate the master building carpenter and cabinet maker for the beautiful woodworking in the manor was none other than my great-grandfather, Michal! And to think that I own and have used the same tools that built that "Sugar Palace"! Your hint and my other discoveries made my mother cry in joy! She is so very excited about the news. Now we go back to Krasiniec and a couple more documents. 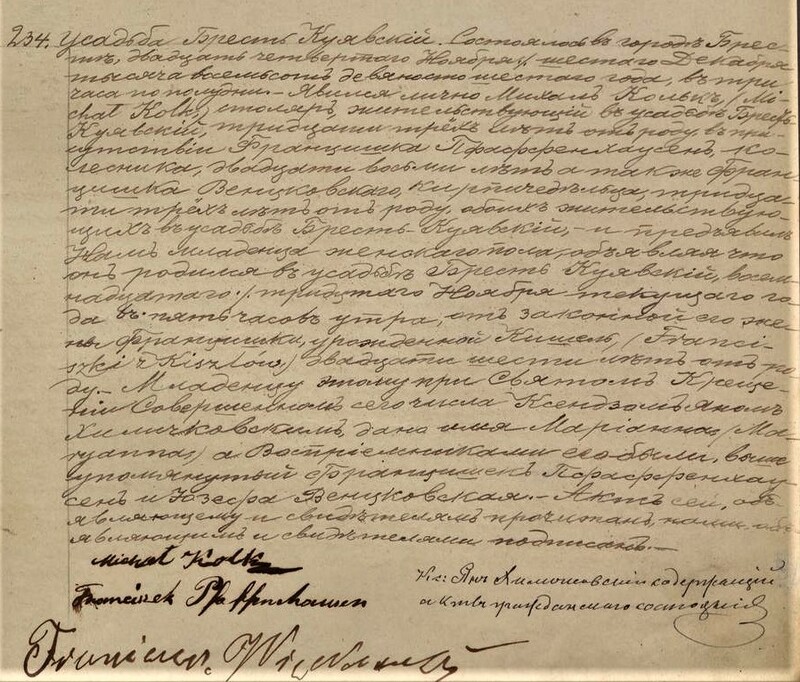 The first, the marriage document of Fryderyck Wilhelm and his first wife, Eleanora (the poor soul who was killed in July of 1882 with her sister, Maryanna and sister-in-law, Anna Kolk). 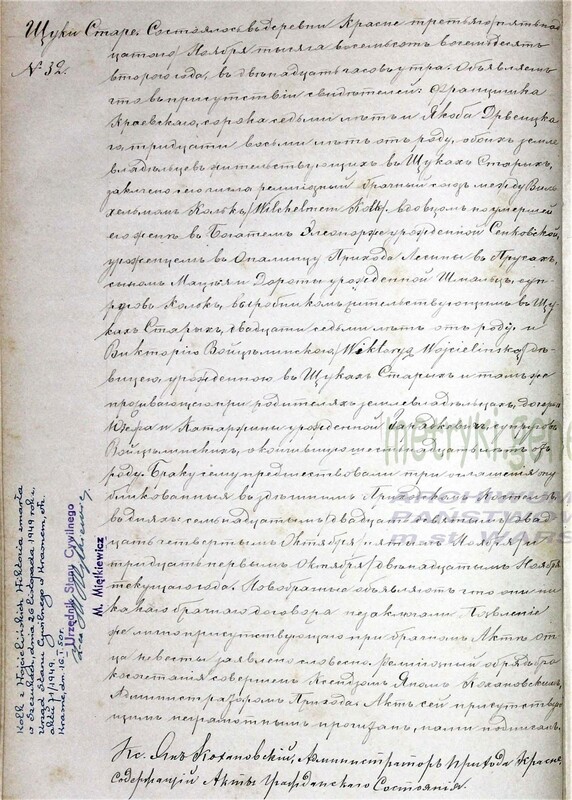 The next documents are those of Michal's parents Maciej and Dorata. The Krasne Church books contain the death records also of several of the children of both Adam and Fryderyck Wilhelm. I have gotten most of the important information from them. An interesting fact I picked up along the way...I wondered at the names of Grandpa Michal and his brothers Fryderyck and Adam, having noted the names were not typically Polish and more Germanic in nature. I found during the times of their birth, Polish priests were replaced with German priests who would not baptize babies with "Polish" sounding names and insisted on German names. Again, many, many thanks to you for everything. My mother said special prayers today at Mass for you and your family. Death records of Maciej and Dorata Kolk. Thanks again for all of your help. 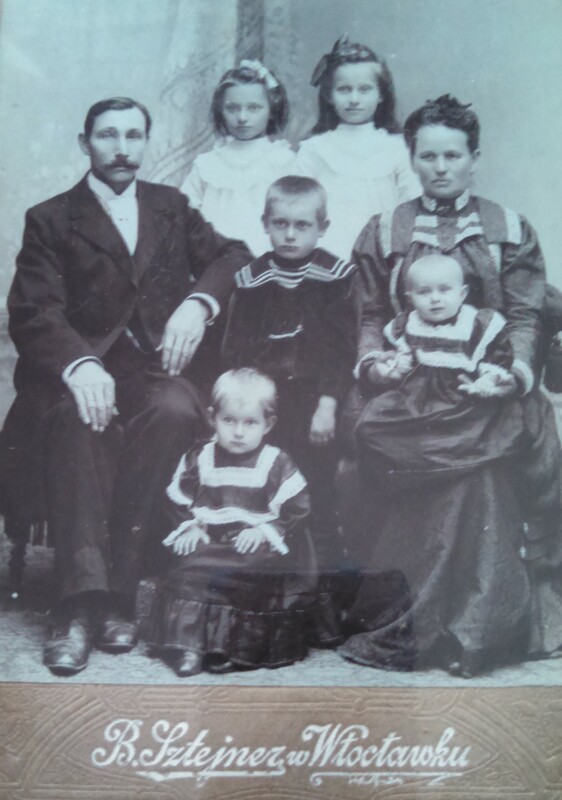 I think I am beginning to put together a clearer picture of my Kolk family in the late 1800-early 1900's. The building of sugar refineries is a key. I have attached the birth records of my 2 remaining great-aunts (Maryanna and Irena) and the record of a cousin, Henryk Leon. Both Michal and brother, Adam, move to Brzesc leaving Wilhelm in Krasiniec with their parents. There is at least one of Adam's children that I am still looking for a birth record - the family's "black sheep", Wladyslaw. Wladyslaw was born around 1892, in neither Krasiniec nor Brzesc. Your "hint" about the "Brzesc Sugar Palace" was perfect! I have since been linked on Facebook to several historians from Brzesc. 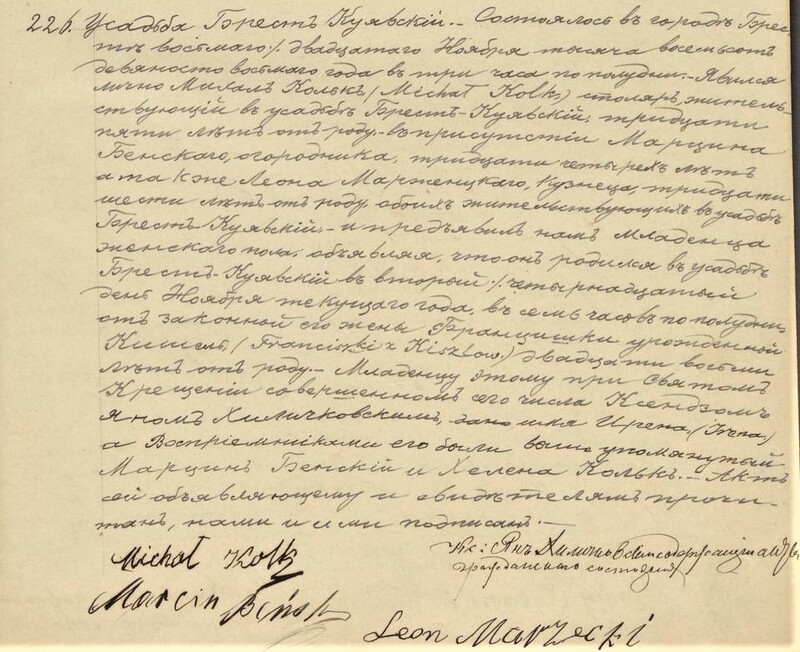 Here is another mystery you may help solve - on my Dziadek Michal's naturalization documents here in the US, he lists the place of birth of his wife, Franciszka Kiszel, as Leoniska. 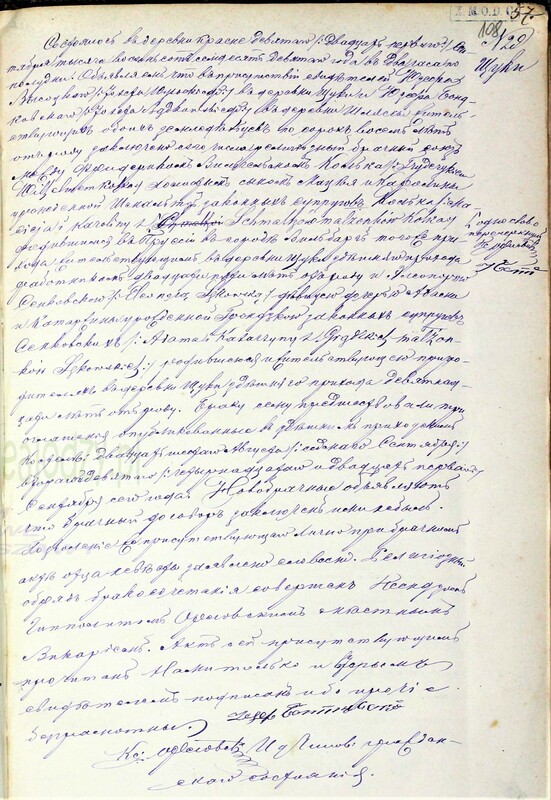 The handwriting does not belong to him so the information was given and transcribed. I have tried several variants of the Polish phonetically and the closest I can come is Lniska which is in Pomerania, which seems a reach from Krasiniec. They were not married in the Krasne Church which leads me to believe they were married in her village. Here again, my ignorance is showing :| Any ideas? My mother and my father, too send their greetings to you and both thank you for the information. I am, again, so very grateful for all you do! Henryk Leon Kolk, born 28 June 1897, bapt. 29 June in Brześć Kuj. mansion of Adam Kolk, locksmith, 37 and Helena Banecka, 26. Godparents:: Marcin Borkowski, gardener, and Franciszka Kolk. Michał Kolk, 34, is one of the witnesses along with the godfather, hence their signatures. Ostatnia3 tygodni 6 dni temu edycja: Molencki (Rafał Molencki) od. Czas generowania strony: 0.802 s.